The first surprise on arriving at Abel Manto’s farm is how green it is, in contrast with the dry brown surroundings. His beans and fruit trees seem oblivious to the persistent drought in the semi-arid hinterland of northeast Brazil, the worst in 50 years. An “underground reservoir” made out of plastic sheets spread below ground to contain water keeps the soil moist, allowing beans to be grown on some 1,000 square metres in spite of the drought. Various techniques for collecting and storing rainwater, including ponds, tanks, connected reservoirs and concrete surfaces, collect nearly 1.9 million litres of water in normal rainfall years on his 10-hectare property, according to Manto. He and his wife and small daughter use 277,000 litres for drinking and cooking. The rest is used to raise small livestock and irrigate the orchards and crops. But this year the drought has reduced his water reserves and he has had to set priorities. Manto chose to save crops that require less water, such as passion fruit and watermelon. Another surprise is the breadth of knowledge Manto displays; he calls himself a “family farmer in transition toward agroecology”. At the age of 40 he has become well-known for his inventive solutions for coping with the periodic droughts of Brazil’s semi-arid northeast. His greatest success is the hydraulic pump he calls “Malhação” (Workout) because it is manual and requires physical effort. About 80 centimetres high, it is made of inexpensive parts, such as plastic tubes and bottles, marbles and even disposable ballpoint pens. Each pump costs just 116 reals (53 US dollars), including pipes for drip irrigation — or 70 percent more if the client prefers a metal handle to make it easier to operate. In this case it loses up to 40 percent of the flow, which in the ordinary model, the T-shaped handle pumps 1,233 litres per hour. The pump is capable of lifting water from a depth of four metres and irrigating at distances of hundreds of metres, depending on the slope. “One buyer told me he could irrigate 600 metres away,” Manto said. The farmer-inventor said he had sold more than 2,000 pumps in the northeast of Brazil and some in South Africa, with interest also being expressed in Europe. He employs 15 people to manufacture them. Now he is trying to adapt a biodigester that he saw in India, using local materials. He is already producing biogas for his kitchen stove, but he is not self-sufficient yet. Since he was a young man, Manto has tried to make rural labour more productive and less tiring. “They called me ‘crazy’ or ‘lazy’ and said I was inventing things so I would not have to work,” he said. Today his innovations have won recognition and his farm is a laboratory and showcase for technologies to develop family farming in the semi-arid region. The many visitors help spread the word about his successful experiments. “Our life has improved 100 percent,” said his wife, Jacira de Oliveira, showing the stronger blue flame on her stove when it burns biogas. “A few years ago it was hard for me to buy a bicycle, even on credit. Now we have a car and two motorbikes,” Manto said. His productive activity is based on precise figures. The drought, which has lasted 27 months so far, caused the loss of 60 percent of his 147 fruit trees of different varieties, such as custard apples, oranges and guavas. “The most mature specimens with the deepest roots survived,” he said. To feed his 38 goats and sheep he turns everything he can find into fodder, even plants considered weeds. And he knows their nutritional qualities. The leaves of the local catingueira tree contain 14 percent protein, the same as Gliricidia sepium, a recognised forage tree. Mata-pastaria, a brush growth despised by local people, has even more protein at 20 to 22 percent. “Many species are regarded as harmful” and their nutritional potential is lost due to traditional beliefs, he said, pointing out the 11 species he has turned into forage in the shed that serves as his silo. The old ways hinder innovation, with the argument that “this is how my father always did it”, he complained. Even within his own family there is resistance from his seven siblings who live on neighbouring farms. His hope, he says, lies in the children. He is currently teaching environmental education to 27 children from his rural community. He would like to have his own school to expand the initiative with an ecology project he has named “The Life of the Soil”. This dream is closer now that he is an official with the municipal secretariat for social and economic development and the environment in Riachão do Jacuipe, headed by 23-year-old Esaú da Silva who saw in Manto someone with the necessary knowledge to develop local agriculture with an environmental perspective. 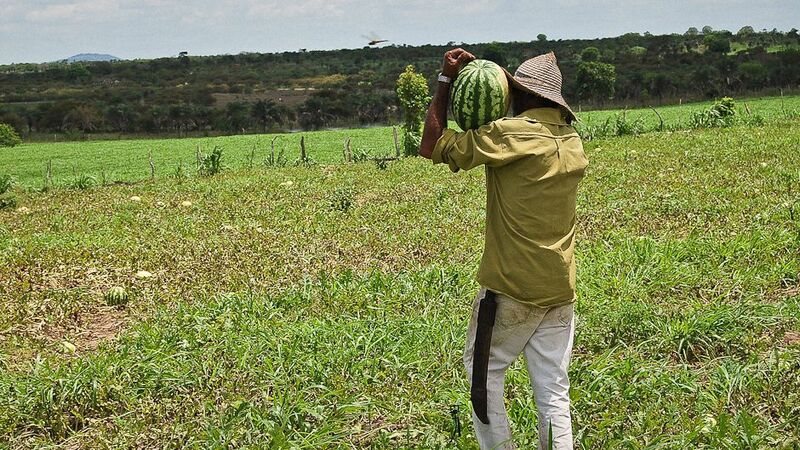 The main problem is not lack of water, but “the lack of technical assistance” for the farmers of the municipality, 40 percent of whose 33,000 people live in rural areas, Silva said. The Jacuipe, the local river, is very polluted, but it flows all year round, which is an advantage in the northeast of Brazil where most rivers dry up completely during the dry season. And “we have lots of dams,” Silva added. Spreading Manto’s experience would lead to making better use of this water, he concluded. But collecting rainwater is key for small farmers throughout the semi-arid region. In Riachão do Jacuipe, in the state of Bahía, rainfall is low with an average of 590 to 660 millimetres a year, and in 2012 it was only 176 millimetres, Manto said. Manto uses the social technologies that have been promoted for the past 14 years by Articulação Semiárido Brasileiro (ASA), a network of more than 800 organisations. The network is halfway to the goal of distributing one million 16,000-litre cisterns. The Brazilian government of leftwing President Dilma Rousseff decided to speed up and overtake this target by distributing 750,000 cisterns in 2013 and 2014. But it opted for industrial mass production of plastic tanks, which subverted ASA’s programme. The new government plan sidelined the traditional concrete slabs that cost half the price of plastic cisterns, and excluded the community from participating in building the tanks on a do-it-yourself basis, which trains people in their use and strengthens the local economy and sense of citizenship. The experience of ASA and Manto also stands in contrast to the project to reroute the São Franciso River, by means of which the government aims to improve water supply for 12 million people in the northeast. This mega-project is delayed by at least four years, and its cost has reached the equivalent of four billion US dollars, nearly twice the original budget. In any case, it will not serve the poorest rural families dispersed throughout the semi-arid region who are the most vulnerable to drought. This is where the cisterns and the government’s social programmes have now been decisive in averting the popular rebellions that took place during previous droughts. This article appears courtesy of Inter Press Service, an independent news agency covering issues such as development, environment, human rights and civil society. Mario Osava has been an IPS correspondent since 1978, first from Portugal, then from Brazil starting in 1980. He has covered events and processes throughout Brazil and has recently been engaged in covering major infrastructural projects that reflect opportunities for development and South American integration. Growing Food in the Desert: Is This the Solution to the World’s Food Crisis?